Every month Christian Audio has a free download for the month. There have been several really good ones that I have downloaded over the past couple of years. The free book for October 2012 is extremely timely though, so I would like to point all of you there. The book? 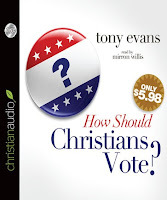 How Should Christians Vote by Tony Evans. I've always enjoyed Tony Evans on the radio. I've never read anything that he has written, but he has always seemed quite sound in his teaching. I haven't listened to this book yet, but I am willing to give it a try. If you download this book, let me know what you think. I am currently listening to another one, so I probaly won't get to this one for another week or so. Anyone want to buy this book for me?